Thanks for taking the time to read our review of the highly rated Tefal GV8932. There are around 25 different steam generator models available from the Tefal brand in the UK market. This model came out as the highest rated of all the models available. It is expensive though, and also one of the most expensive in their entire range. Of the 25 models available from Tefal the prices range from about £75-£300. This 8932 model sits right at the higher end. That price will put many buyers off, but according to those who have bought it, the ratings speak highly of this high end model. This model is packed with features all aimed at making your ironing faster and easier. Who Would Buy the Tefal GV8932? How Buyers Rate the GV8932 Model? 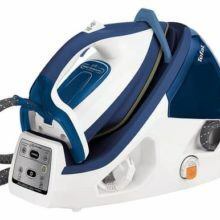 This model of iron is suitable for buyers who want to really reduce the amount of ironing time. Every buyer said that it made ironing very easy. The large water tank meant that buyers could simply get on with doing the ironing, rather than having to pause to fill up a tank. Almost every buyer said it cut ironing time in half. A few buyers owned holiday cottages and they said this really saved them a lot of time, when it came to ironing bedding and towels. Some other buyers said that this iron made short work of shirts and jeans. Overall buyers gave this one an excellent rating of 96%. As you can see from this extensive list, this model is packed with all the right features. The 2,400 watts means the iron is ready to go in 2 minutes. The large tank means you can get all your ironing done without any interruptions. The bar pressure is one of the highest on the market, as is the steam per minute and the steam boost when required. Add to that the important safety features and a simple to remove scale collector, and you have got a very high quality iron. 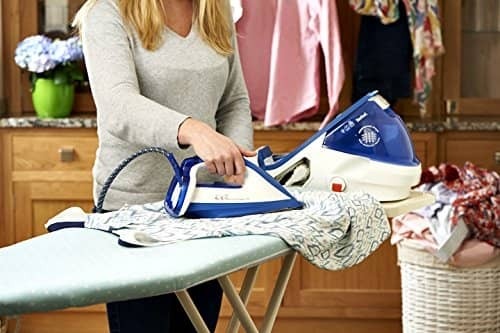 Buyers said this iron simply glided over clothes, and many said this one was especially good at getting rid of creases on tougher materials like jeans. Hopefully we have provided you with enough information to decide if the Tefal GV8932 model is the right one for your needs. The kicker for most people will be the high price point, and at that price, it will put a lot of people off. If you can afford it then by all means get this one, as it is simply the best option in the Tefal range of steam generator irons. We like the fact that there are no bad reviews, and in fact this model gets the highest buyer rating reviews in the entire Tefal range. 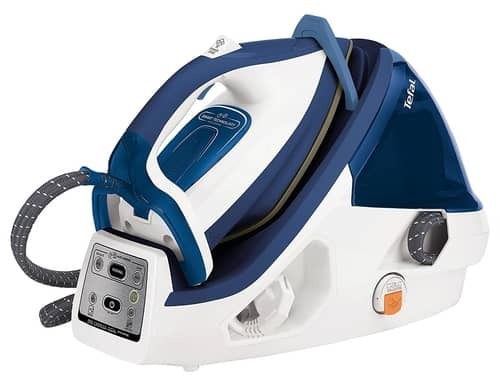 If you want an iron that is more affordable, then we would recommend the Tefal SV7040 Liberty steam generator which is much more affordable, but still gets a very high 90% buyer satisfaction rating. We have done a full review on the Tefal SV7040 which you can read by clicking this link. Question - How long is the guarantee on this model? Answer - According to the Tefal website for small electrical appliances, "The guarantee period in the United Kingdom and Republic of Ireland for Tefal appliances sold until 31 December 2016 is 1 year and 2 years on appliances purchased from 1st January 2017." Question - Do you need to hold the steam button down all the time? Answer - With most steam generator irons you do, and you also have to do that with this one. Our advice is don't let that put you off as you get used to doing that really quickly.